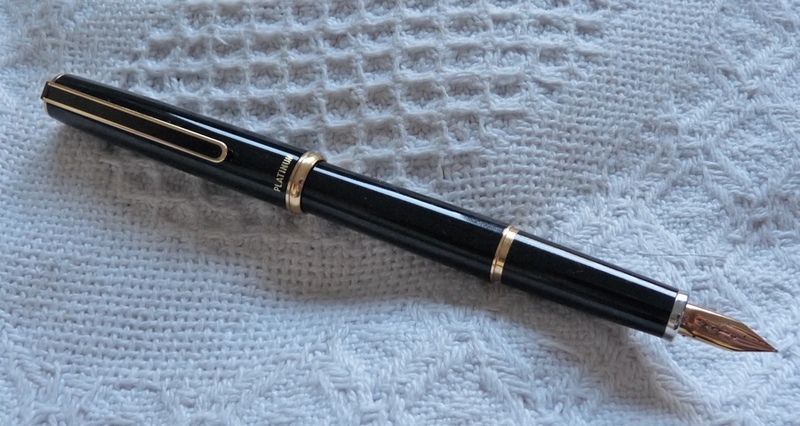 Platinum PTL-5000 Fountain Pen Review – Pens! Paper! Pencils! Gold nibs are hard to find for less than £50 and usually cost an awful lot more, so a whole pen for less than that, featuring a gold nib, is going to be either something rather special or a golden turkey. Thank you to Cult Pens for sending me this pen to review. These are my honest opinions. It’s clear that most of the production costs are going to go into the nib. This results in a pen that’s quite small. It’s nevertheless comfortable in the hand, particularly when posted (which it does securely). 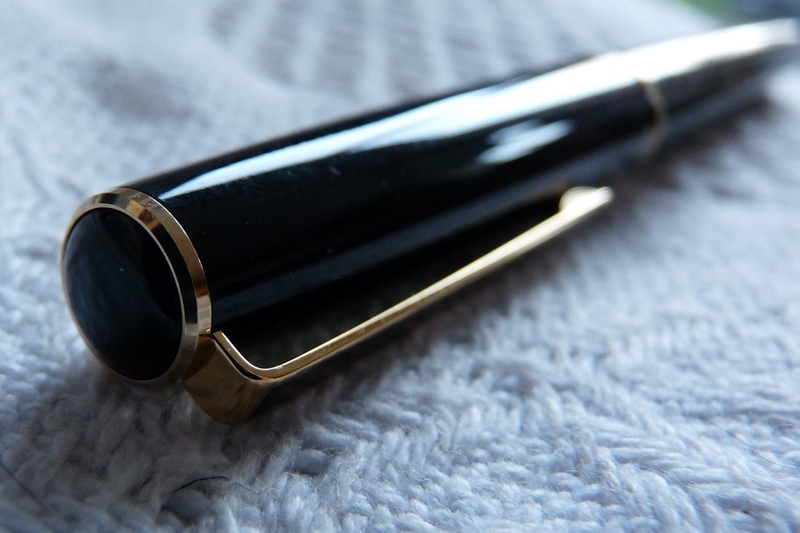 It’s a very light, very obviously plastic, pen but if you’re into the whole black and gold deal it looks absolutely fine. The metal clip is reasonably sturdy and performs as it should. The cap pushes closed with a nice little click. There’s nothing wrong with the construction or design of this pen at all, although there’s nothing at all special about it either. It’s the barrel of a pen that would normally cost about half the amount but that’s okay because you’re paying for a special nib… right? 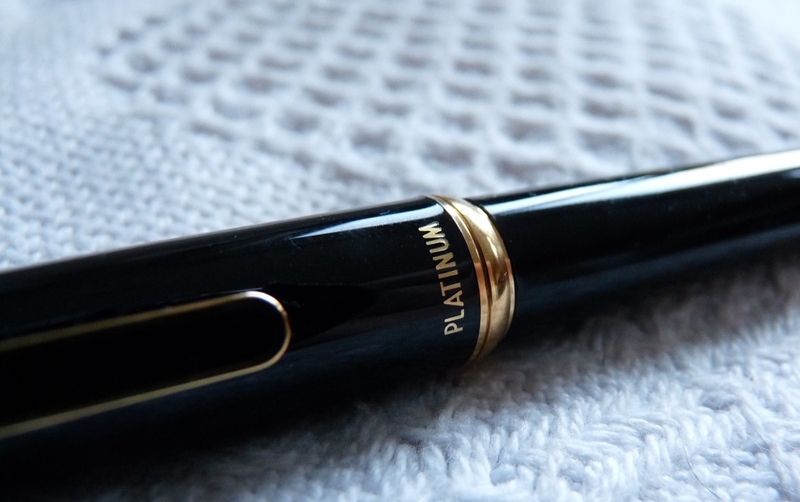 Platinum use their own cartridge/converter system, which means a limited choice of cartridges or added expense if you want to use a converter: not including one is another cost saving. I used a converter I already had. The nib. It’s gold, and gold is best, yes? Well, yes, the best gold nibs have just the tiniest bit of spring and extra smoothness to them that lifts them above the best steel nibs. But the best steel nibs (and these needn’t cost a fortune) are every bit as smooth as the vast majority of gold nibs. An example: the Diplomat Traveller. This pen looks similar to the PTL-5000, costs a little less, has a metal barrel and a beautifully smooth steel nib. All the Faber-Castell pens I’ve tried have had gorgeously smooth nibs too, as have most TWSBIs and Pilots of a similar price. What is so disappointing about this pen is that not only is the nib no better than any of these pens, it’s actually significantly worse. It isn’t particularly smooth and it has absolutely no spring to it whatsoever. It’s as hard as a nail, which I don’t mind in this price range, but which is not the point of a gold nib at all. My favourite nibs in the world are both on Platinum pens (the President and the #3776 Sai) but this nib is not good, not good at all. 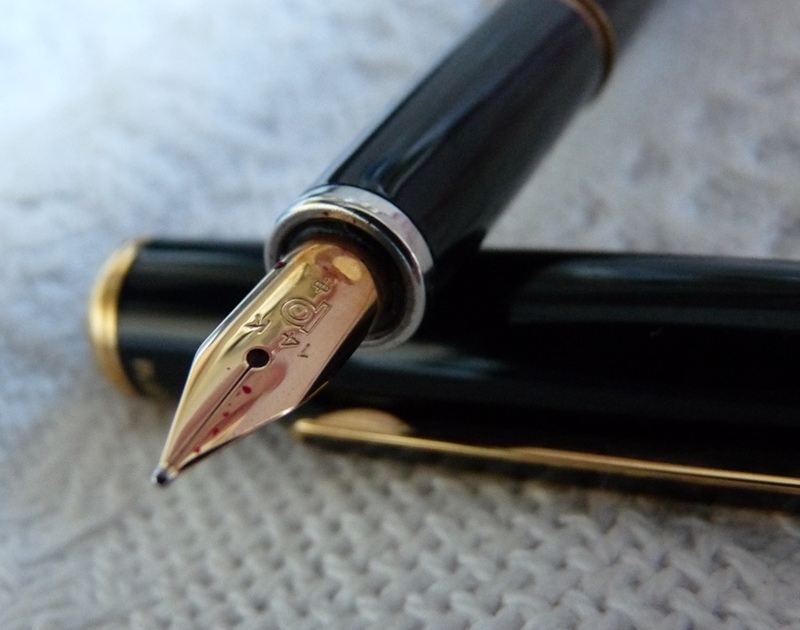 The PTL-5000 is a pen that stakes everything on the nib and it falls short. If you buy this as a way of experiencing a gold nib on a budget then you are wasting your money. This pen tells you nothing about the experience of a good gold nib and you are paying over double what the barrel is worth. 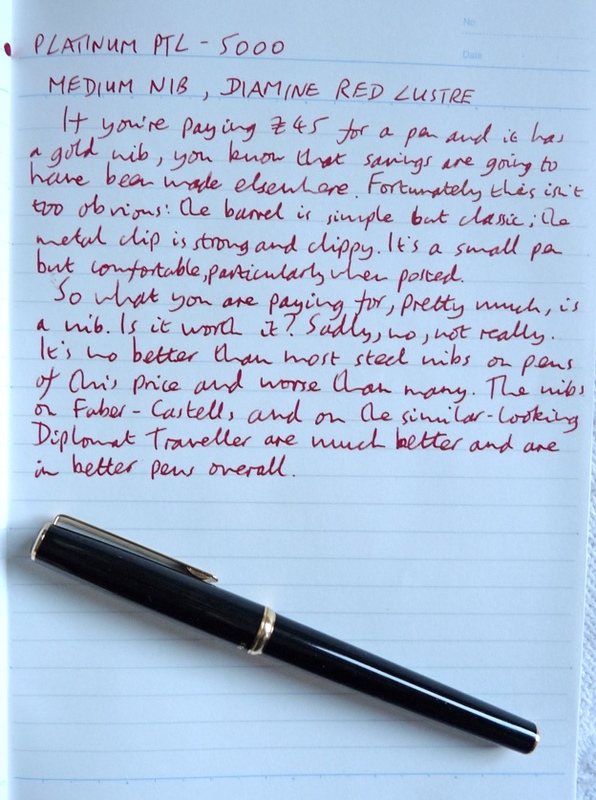 Spend your money on a better pen with a better steal nib or save up for a Platinum #3776 or a something from the Pilot Custom range. When I told my United Inkdom colleagues about my experience with the nib, they suggested I return it to Cult Pens to see if it was faulty. It wasn’t but it travelled back to me via Scribble Monboddo who massaged the nib a little before sending returning it to me. It’s a little better now, there’s a touch of give to the nib and it’s a tiny bit smoother. It’s still worse than many steel nibs in this price range and it still doesn’t give you an idea about what a good gold nib is like. 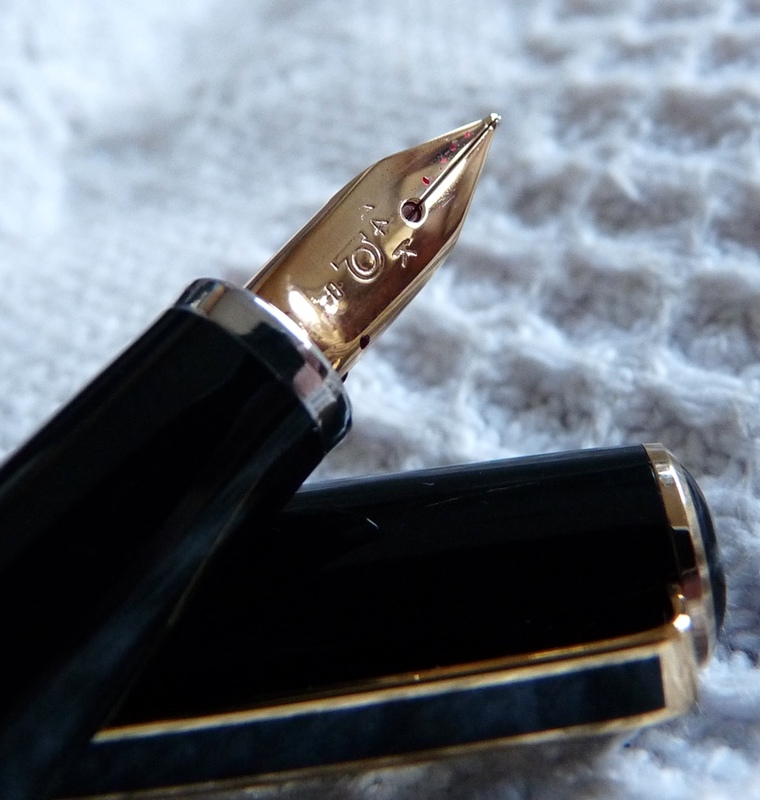 Have you tried the Pelikan M800? It’s another nail but far more expensive. Out of my budget unfortunately!